District Public School (DPS) Rajanpur Punjab. 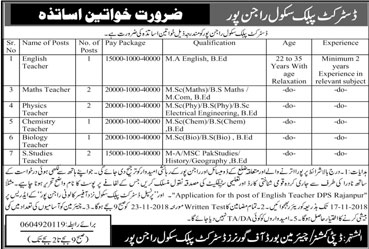 Interested candidates may apply along with the application, Education/experience certificates, CNIC, Domicile, and fresh passport size photographs to the following Mailing Address: Deputy Commissioner, BOG, District Public School (DPS) Rajanpur. latest by November 17, 2018. Board Of Governors, District Public School (DPS) Rajanpur.